I first read about this Atlas in On the Map by Simon Garfield. It sounded fascinating – the work of Herbert Bayer, of Bauhaus fame, of whom I learned about in design school at The Ohio State University. The book sounded like a great mix of graphic design and maps. I really wanted to see it. It was created as a promotional piece for the Container Corporation of America, where Bayer worked. Luckily, they have a copy at the New York Public Library. This was a challenge to my “library anxiety” as the book was listed as “offsite”, meaning they have to get it from another location and deliver it to the The Lionel Pincus and Princess Firyal Map Division reading room. It takes a couple of days, so this means “advanced planning” and commitment. I ordered it with another book that sounded intriguing, “Ideal Atlas of Detroit”, which turned out to be a Hagstrom’s-like atlas. 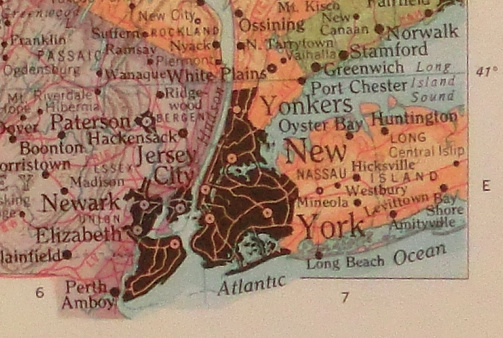 It had the same color scheme, the same typography – the same look – as the Hagstrom’s of Manhattan I bought when I first moved to NYC years ago (when people still bought maps). I got through that pretty quickly, then moved onto CAA Atlas. What a ride. I looked at it for 3 hours straight. As I turned the pages, I was struck by the colors used. I’ve been aware of the different color palettes of maps from various periods – tans, blacks and browns of antique maps, the dusty pinks, gray greens and blues in real estate maps of the 1800’s and then this wild mix of bright and unusual color in Bayer’s book from the 50s, as if he anticipated the flower power era that would come about 15 years after this project. The first part of the book set the scene. Again in Bayer’s forward, he implies you can’t properly study maps unless you know something about the physical world. There are articles about geography, astronomy, climatology, demography and economics, all of which occur throughout the book as Herb tries to paint as detailed a picture as he can within 2 to 4 pages of each geographic place. The diagrams and illustrations in the explanations are clear, clean and wonderful. Skimming the information, you can learn a lot without even trying. This is evidence of “chunking” information – way before USA Today was around. Onto the maps! Of course the USA is first, but take a look at the contents. Herb didn’t order the states in the same ol’ alphabetical order – what’s the sense in that? 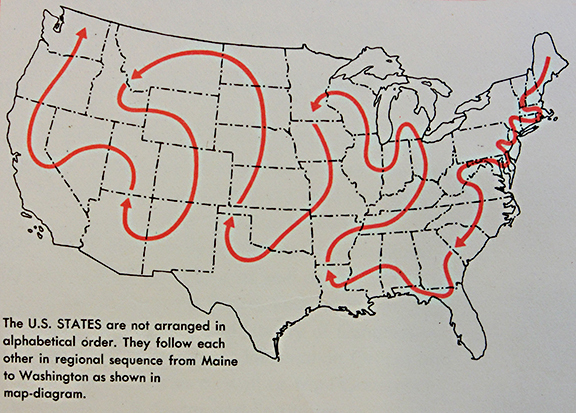 He provides us with a diagram of 48 states (it’s 1952-3, Hawaii and Alaska didn’t join until 1959.) He uses a squiggly line across the continental states, like a game – try to touch all 48 states without picking up your pencil. Maine is first, in all it’s glory. Yep, lobsters, potatos and pine. No moose, though, must be on some other state. Pretty standard. 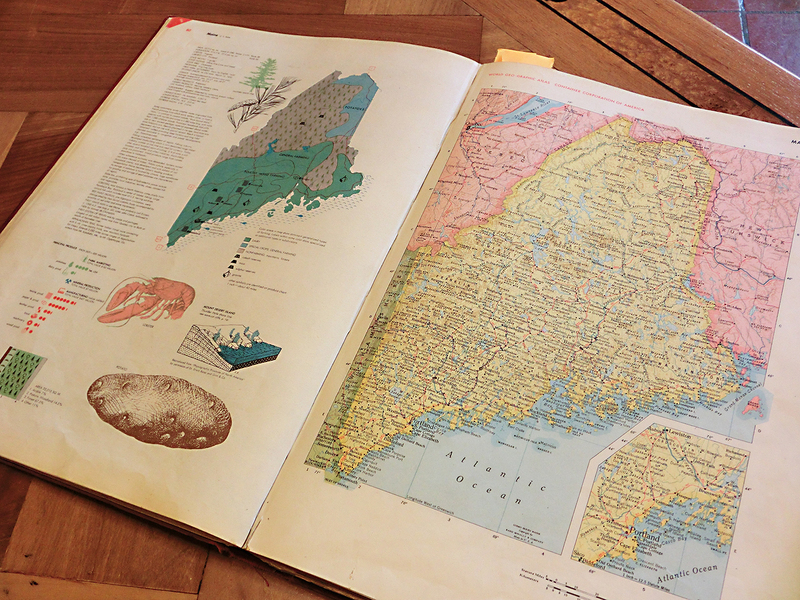 I notice as I carefully turn each page that each one contains the same types of information: some basic statistics, industry and agriculture maps and a few images of state-related items. I flip to New York and see how the major cities are black, which in New York’s case, is against a bright pinkish, orange map. The black is quite unusual. Orange roads pop from each tiny metropolis. New Jersey – oh, let’s look. Where is the Garden State Parkway? It’s not there? (Parts of it did exist at this time.) Those red lines, they have letter designators, but I don’t see a “GSP”. The red lines are railways, not highways. 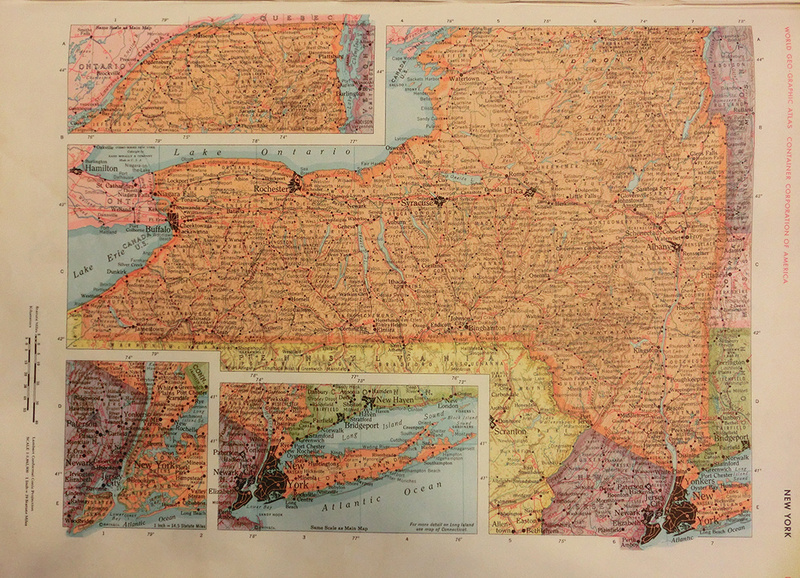 Oddly, it seems there are no highways or roads on these state maps. Interesting. I start over with Maine (remember, Maine is first) and go through each state, not wanting to miss anything. When I get to Florida – whoa! It suddenly gets crazy. Check out the colors, the collage of Floridian things that Herb’s team has assembled. The page is bright and brash in design and color, just like Florida. That coral-pink-orange-y color is popping off the page. They exploit the translucent quality of the inks by overlapping a cabbage palmetto with an orange and an orchid. The flamingo is dead center. A flamingo! Ponce de Leon’s signature is scrawled like some new world hieroglyphic. An alligator, a sailfish and delicious chart of juicy produce (not the boring staples of corn and wheat from the Midwest) Beautiful. Now it’s getting fun. I look at each state carefully. It seems I’m reliving my grade school education. I’m really enjoying sitting in this stately room in one of the most important libraries in the world, at a big wood table, surrounded by globes, books, carved woodwork and a painted ceiling. The other tables are crowded with people reading and studying. The main reading rooms of the library are closed for renovation, so many camp out here. Tour groups and families wander in cautiously to look at this magnificent room. Occasionally one or two will sit at my table, not seeing the sign that says the table is reserved for people looking at maps. The librarian quietly whisks over to ask them to move, and they do. I get sucked into the numerous and interesting graphic diagrams about flight distance (remember, it’s the 50’s, air travel was new), number of heads of cattle, miles of railroad, population and tiny comparative squares for each state (arable, pasture, woodland, forest and other-“small multiples”, as Tufte would call them). Each is wonderfully designed and easy to understand. Bayer and his team have designed a set of symbols that is very similar to Gerd Arnst’s Isotypes. I wonder how connected they really are. They make delicious repeating patterns that add to the collage of information. Two million metric tons of corn dance across the page. After I flip through the entire book once or twice, I decide to look for some places friends live. I have a friend in Spain and I think I should send him a photo of the country’s page. After reading it, I decide not too – I don’t think he would appreciate his country being labeled “one of the most retarded, least populated countries.”, “When colonial wealth failed, developed no substitute wealth or leadership.” …“dictatorship rules prostrate nation of destitute people.” Whoa! I encourage you to look at this book, if you can find it. Perhaps those people who made a Kickstarter campaign to reprint Vignelli’s NYCTA Graphic Standards Manual would consider this for their next project.